Photo: North Buttress Couloir to the right… and the more severe Northeast Couloir to the left. 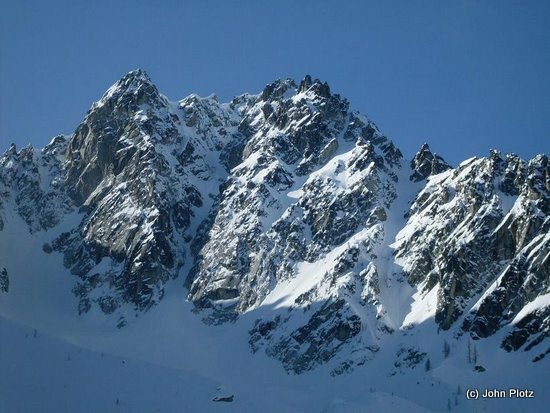 Colchuck Peak is modest when compared to its gargantuan neighbor Dragontail Peak. However, its diminutive stature is actually its strength. Indeed, Dragontail has many enticing lines to climb and ski. 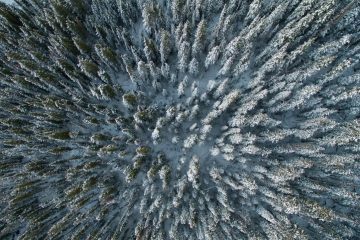 But by its sheer bulk and vertical relief, its routes usually turn into multi-day endeavors, especially in winter when one has to park four miles from the trailhead. Colchuck Peak on the other hand, has many quick-hits that run the backcountry skiing gamete from no-fall couloirs to the relax-and-ride glacier. The North Buttress Couloir falls between those bookends. 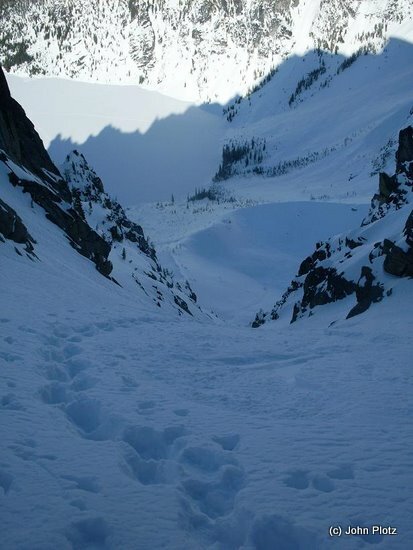 From the lake, this couloir rises 2,000′ to a notch. From there, time and energy allowing, one can traverse south and ascend another 1,500′ to the summit of Colchuck via its Northwest Face. And what can be climbed can certainly be skied! The North Buttress Couloir is steep and still a serious ski descent. A fall on its steepest sections would mean a long slide back down towards the lake and possibly colliding with a few rocks en route. As well, the couloir usually has an icy crux in the first 1,000′, requiring a couple tools, rope, and ice screws to ascend. But the normal ice hasn’t formed this year, instead we found the route covered with soft powder. Photo: It’s steep, even if not extreme…unless ice forms. Then steep becomes extreme. Scott McCallister and I found this to be the case as we kicked steps up the gully. The soft snow made for slower going, but that also translates into bigger grins on the ski back down. 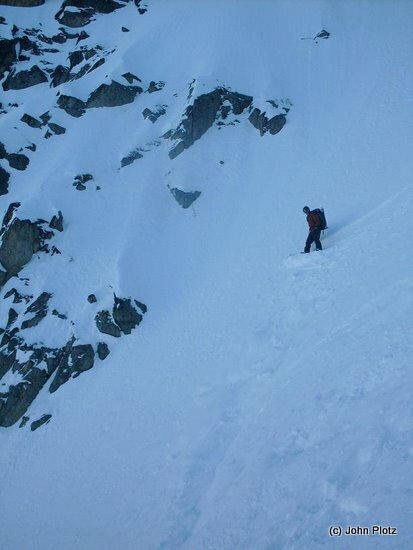 Scott utilizes a split-board for his descents, and managed just fine in this couloir. From the base of the couloir to the notch, it took us one and a half hours of solid work to get to the top of the couloir. Photo: Scott boarding in the couloir. 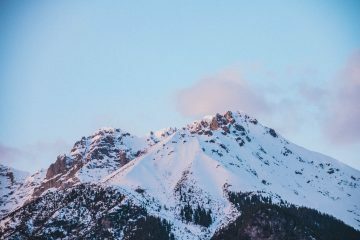 Overall, I found this ski tour to be one of the most enjoyable in our area. The access is very straight-forward, and there are no route-finding problems. Just boot straight up the couloir. And if there’s no ice in there (like this year), one only needs lightweight crampons and an ice axe. In the upper portion of the couloir, I shelved the axe and used two ski poles. Keep in mind, one of my poles is a “whippet” so I still had self-arrest capabilities. In the right conditions, this tour ranks as one of the classics of our high Leavenworth alpine! Skill: 3+ (advanced to expert). Equipment. Appropriate ski-touring gear, ice axe, crampons, avalanche gear, and helmet. In icy conditions a rope and ice climbing gear may be needed for crux sections of the route. Map. 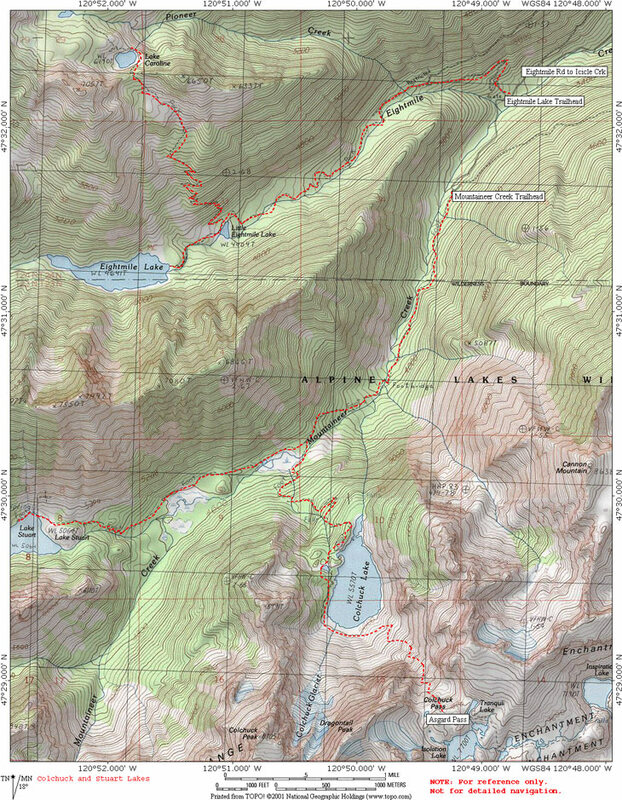 Map of approach trails below. 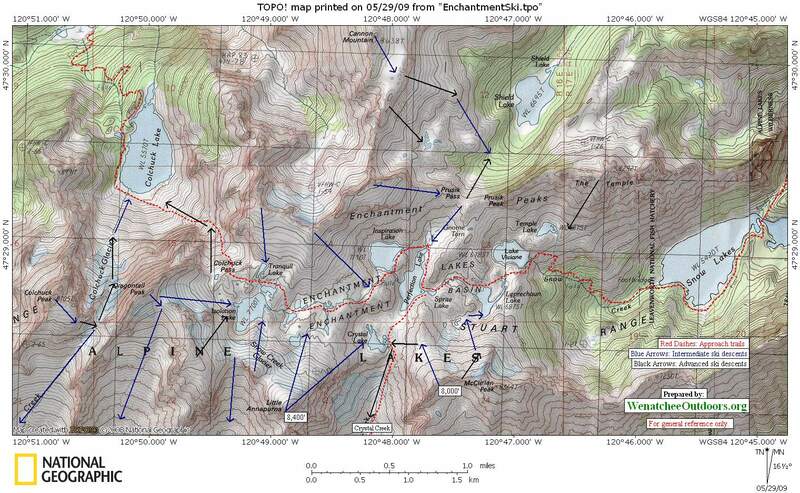 Map of ski lines around Colchuck Lake and Aasgard Pass below as well. The north buttress couloir is not noted on our map but the NE couloir is the main north-side cleft in the mountain starting east of the summit.